We’ve all experienced it: the temptation to fill any gap in conversation. We rush to speak so we can avoid any awkwardness. 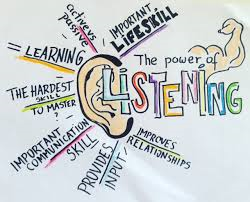 But sometimes we need to allow people the opportunity to process their thoughts and take time to really listen. It’s often easier to jump in with quick-fix solutions rather than giving space for ideas to develop. Obviously, we can’t give this space to everyone and there are times we should fill those gaps. But to let important relationships grow we need to be willing to ’give silence’. That means really listening. When I first got married my husband would say, “Don’t give me a problem I can’t solve!” He is very solution-focused and in his desire to help, wanted to jump in with answers. I would reply in frustration, “I don’t want you to fix it, I just want you to listen.” I need time to process and help to unpick my thinking – often I have ideas and answers when I have space to think out loud. Over the years we’ve become much better at listening and giving each other this space and the results are often moments of inspiration and creativity. It has deepened our connection as we have learned to wait and not rush to answer. I see the temptation with my children to rush in and give them answers to their problems. Often what they actually need is a cuddle and for me to listen. The result is usually a deeper connection with them. Take the listening challenge this week and give the gift of silence to some of your friends and family. Give them your undivided attention (yes that means putting your phone down!) and really listen. You might discover something, understand better, unlock creativity or just connect on a deeper level. We can miss these things when we try to rush in with a response or are distracted by other things that prevent us from really listening.